Discussion in 'Online Games - News and Reviews' started by Kotsy, Oct 14, 2014.
from JVH have a familiar ring to them. The familiarity is what has players coming back for more and makes them an all time favorite. But, they also add a bit of a twist to each one they release. Each fruit pub slot has a special theme to them and Inferno™ is on fire! and that's what makes it a great slot to play. Sometimes it's nice to go back to the basics. Inferno™ is burning up on 3 rows and 5 paylines. Not many like the fact of the 5 payline, but this is pretty typical with the classic slots. With this online slot, the winning could be substantial for the player. Novomatic makes the game play quite easy to understand. There's no guessing as to what you're betting or the number or lines to play. With Inferno, the 5 paylines are fixed and the minimum bet is set at 40.
want to sit back and see what is burning for you to win. Did you know you can also gamble your winnings to increase your payout? Listen to the classic sounds of a land based slot game and win with this one. Love to hear the bells go off for a winning line. Golden Bell with wings, Purple Grapes, Plum, Orange, Lime and Cherries. The Crown symbol is the Scatter symbol and 3 or more anywhere on the reels will bring you a payout. One great feature with Inferno, is that symbols can be stacked on the reels. This could net the player some incredible winnings should the symbols align up for a winning payline. You could be on fire with this. 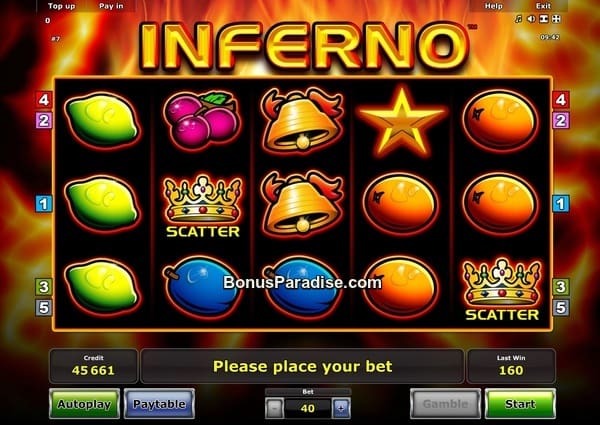 Whether your a fan or not of the Fruit slot machines or the basic slots, give Inferno a spin. You may be come a fan after all. You think this one is burning with winnings? Try playing another fruit inspired slot from JVH Gaming; Fruitilicious. Looking Forward to play this one. I love the Errel Slots! The Game Inferno is now available to play online at Stargames Slots! 5 Stars pays really big money! on 40 Cents €1000!